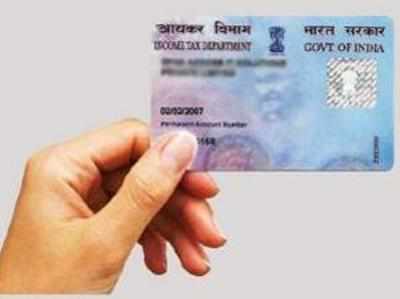 PAN will also be mandatory for term deposits exceeding Rs 50,000 at one go. NEW DELHI: Furnishing PAN will be mandatory from Friday for cash transactions such as hotel or foreign travel bills exceeding Rs 50,000 - a move aimed at curbing the black money menace. Besides, PAN will be a must for all transactions, including purchase of jewellery, above Rs 2 lakhs in cash or through card with effect from January 1, 2016, the finance ministry said in a notification. PAN will also be mandatory on purchase of immovable property of over Rs 10 lakh. This will be a relief to small home buyers as previously the government had proposed to make PAN mandatory for property worth Rs 5 lakh. Quoting of Permanent Account Number (PAN) will also be mandatory for term deposits exceeding Rs 50,000 at one go or Rs 5 lakh in a year with banks, Post Offices and NBFCs. The notification said PAN would be mandatory for payments of more than Rs 50,000 for cash cards or prepaid instruments as well as for acquiring shares of unlisted companies for Rs 1 lakh and above. It has also been made mandatory for opening all bank accounts except Pradhan Mantri Jan Dhan Yojana accounts. Finance minister Arun Jaitley had earlier this month announced in Parliament that PAN would be made mandatory for all cash and card transactions beyond Rs 2 lakh. The limit is double of Rs 1 lakh that he had proposed in 2015-16 Budget, but is lower than the existing threshold of Rs 5 lakh. Making cash deposit of more than Rs 50,000 or purchase of bank draft/pay orders/bankers cheque of equal denomination on a single day, payment of life insurance premium of Rs 50,000 in a year would also require quoting of PAN. In keeping with the government's thrust on financial inclusion, opening of a no-frills bank account such as a Jan Dhan account will not require PAN. Other than that, the requirement of PAN applies to opening of all bank accounts including in co-operative banks.